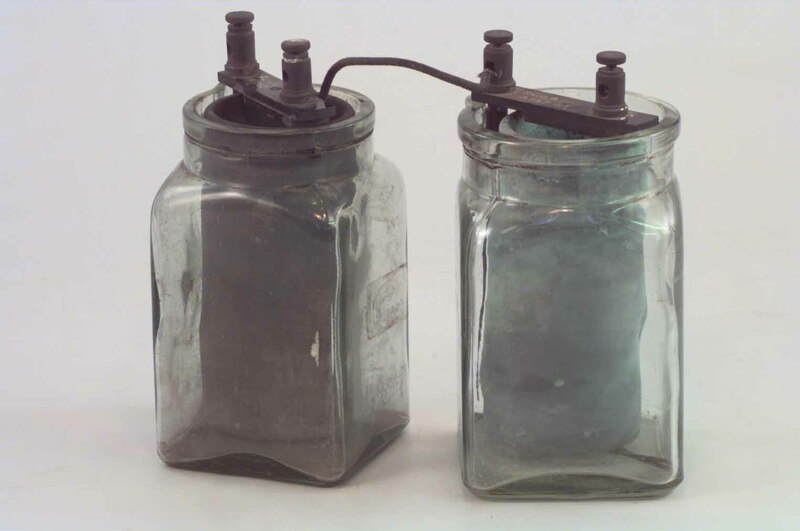 Two Glass square-section vessels with a circular openings on top. Base of vessels 9.5*9.5, height 16, total height 20. F2/4 embossed in base of one. Ceramic pots 7cm diameters. 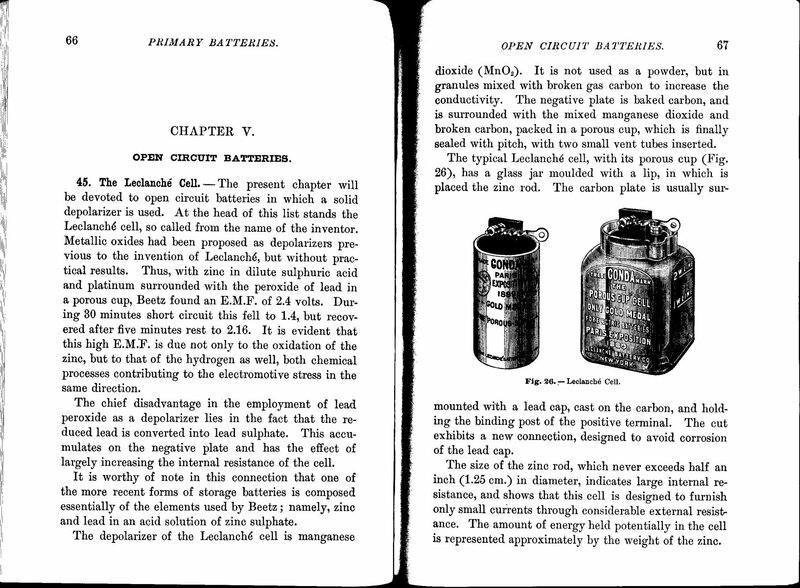 Invented by French scientist Georges Leclanche (1839-1882) in 1866, this battery in its usual form uses a central carbon electrode surrounded by manganese dioxide in a porous (old form) or agglomerate carbon blocks (new form), with zinc rod for the positive terminal placed in a solution of ammonium chloride (sal ammoniac) in a glass bottle outside the central electrode. To maintain the efficiency of the cell it should be placed in a cool dry situation, a little water added occasionally to compensate for the evaporation of the liquid and at intervals, a little sal ammoniac. 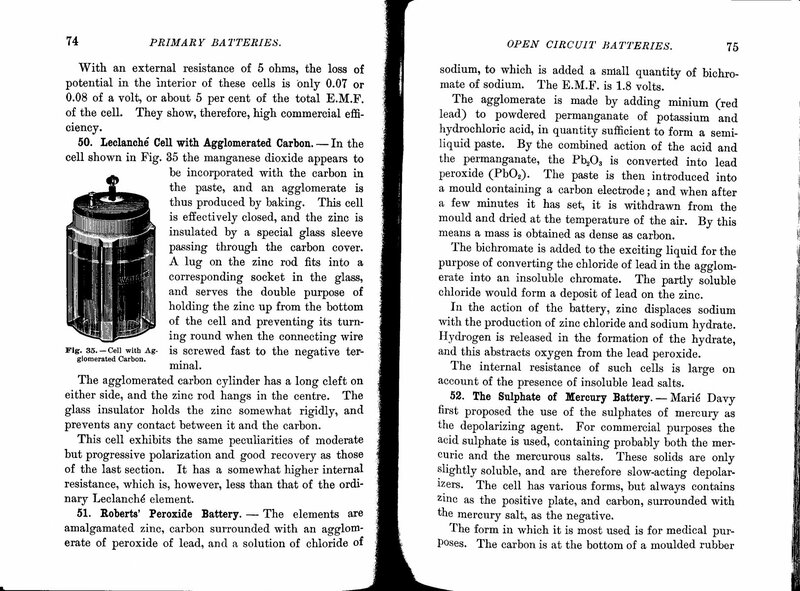 With a little rest, any accumulation of hydrogen becomes oxidised and the cell recovers its power. The e.m.f. 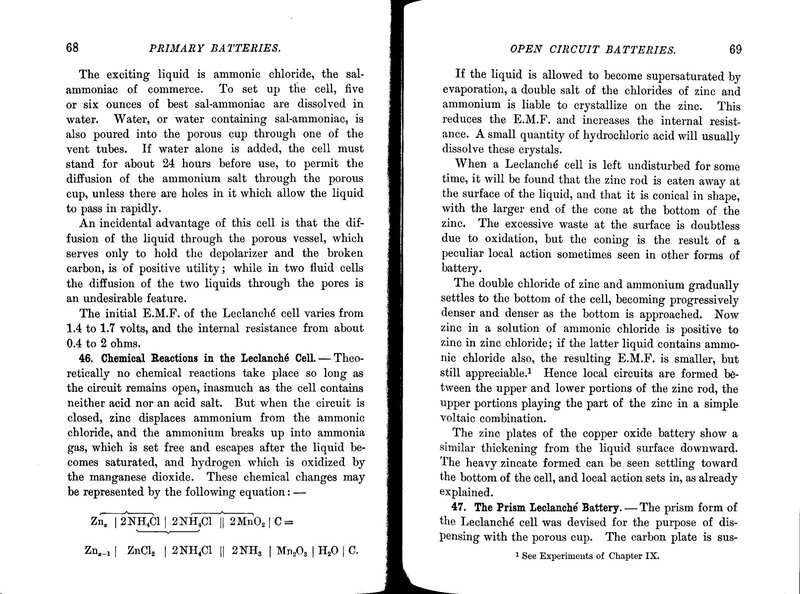 of a Leclanche cell is about 1.5 volts buts its resistance may amount to several ohms when a porous pot is employed. It was used extensively for telegraphy, signalling and electric bell work; and for most work where intermittent current is required and where it is essential that the battery should require very little attention from time to time. 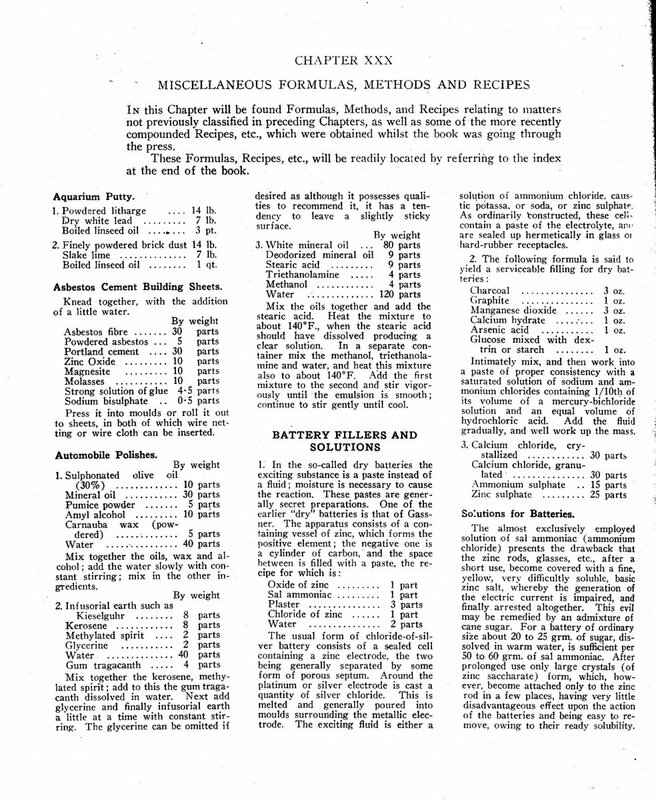 John Griffin and Sons XIV Ed. 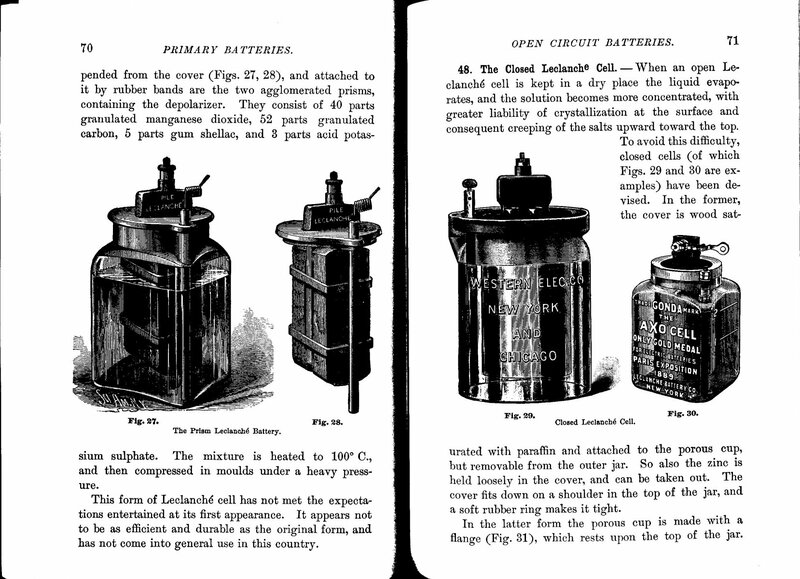 Catalogue of Scientific Apparatus. H.T. Davidge and R.W. 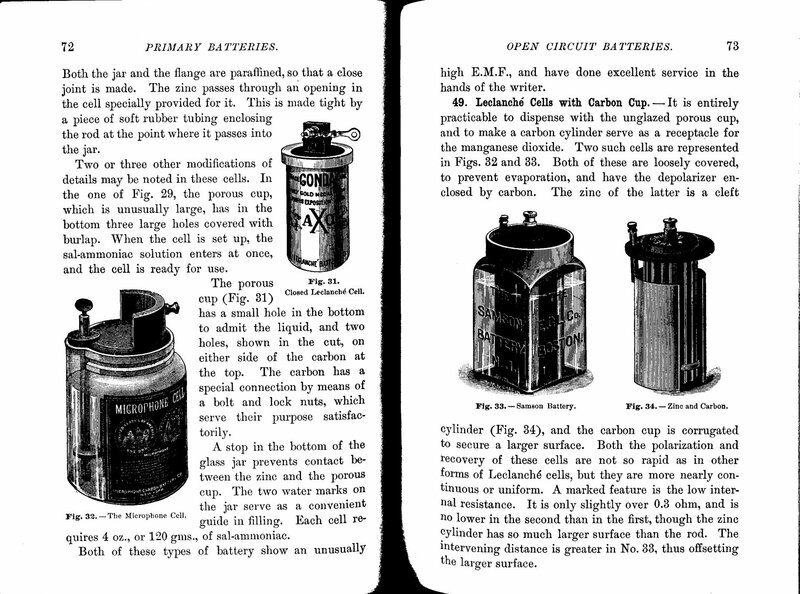 Hutchinson, Technical Electricity, University Tutorial Press, London, 1912, p230.